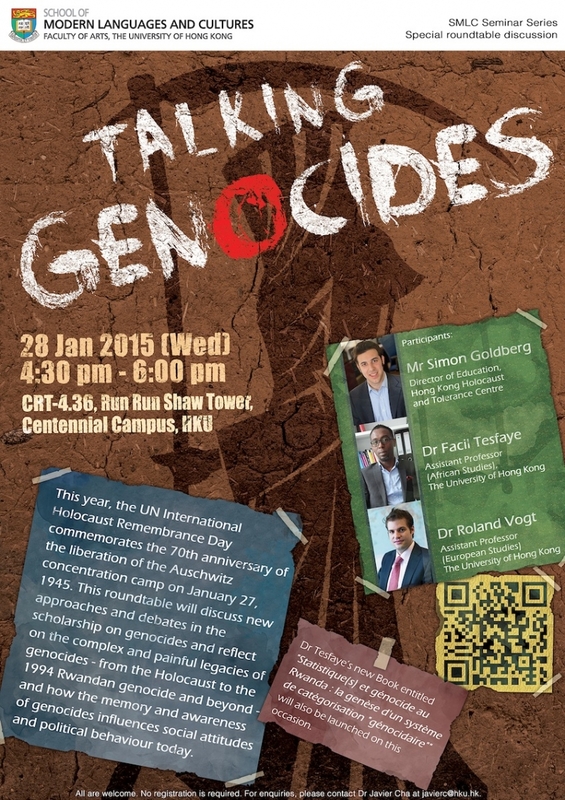 On Wednesday, January 28, HKHTC Director of Education, Simon Goldberg, delivered a talk at the “Talking Genocides” forum organized by the School of Modern Languages and Cultures at Hong Kong University to mark the 70th anniversary of the liberation of Auschwitz-Birkenau. 50 doctoral students and academics were in attendance. Simon’s talk dealt with the scholary discourse on Holocaust representation and issues within the field of comparative genocide studies. Fellow panelist and moderator, Dr Roland Vogt of HKU’s Department of European Studies, addressed the role of the Holocaust in European political imagination and culture. Finally, Dr Facil Tesfaye of HKU’s African Studies Department discussed the role of census data/statistics in the 1994 Rwandan genocide, and its legacy for African politics and peacekeeping on the continent. Dr Tesfaye’s new book, Statisques(s) et génocide au Rwanda: La genèse d’un système de catégorisation génocidaire, was also launched on this occasion.